French judges have rejected a bid by survivors of Rwanda’s genocide to reopen an investigation into claims that French troops were responsible for the deaths of hundreds of people they had promised to rescue. A source close to the case said Wednesday that three war crimes judges had on November 22 dismissed the bid to reopen an investigation that symbolizes deep wounds between Rwanda and France over the 1994 slaughter. 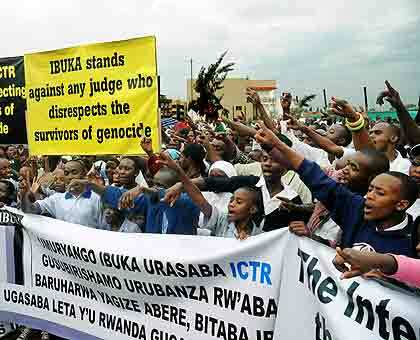 Six survivors, backed by human rights groups and other plaintiffs, had launched a legal case in 2005 accusing French soldiers of abandoning Tutsi civilians in Bisesero, western Rwanda, in June 1994. The probe was shut down in July as no one had been charged during 13 years of investigation. The survivors say French soldiers had promised to rescue terrified Tutsis hiding in the hills of Bisesero at the height of the killing on June 27, 1994. The troops arrived only three days later — after hundreds of people had been massacred by genocidal allies of the Hutu government which had been backed by Paris for years. Their deaths came nearly three months into the 100-day killing spree that left an estimated 800,000 people dead, most of them members of the Tutsi ethnic minority. In October, the plaintiffs’ lawyers filed a request urging investigators to take further action despite the case being closed, including seeking testimony from soldiers and journalists who were nearby on June 27, 1994. But the judges ruled that further enquiry would “not be useful to ascertain the truth, nor reasonable given how long proceedings have been underway”. Patrick Baudouin, a lawyer for the Paris-based International Federation for Human Rights, said the plaintiffs intended to appeal the latest decision. France’s support for the ethnic Hutu forces which carried out most of the slaughter has been a source of deep acrimony in its relations with Rwanda ever since the genocide. France has admitted mistakes but denied Rwandan accusations of complicity in the mass killings. Source: First appeared in AFP today.